This month’s Our Daily Bread Designs Challenge at Operation Write Home Stars and Stamps was to make your own background to be used on a card. I’ve been really into the backgrounds thing lately with my mixed media explorations. I thought I’d do something a little more mainstream for an OWH card, so I used Distress Inks through a stencil. This is a favorite technique of mine. I just take several colors of Distress Ink and apply it with a sponge applicator through a stencil, blending the colors. Then I stamped on top and die cut it and it looks like a piece of patterned paper. Thanks for visiting today. This entry was posted on Monday, September 22nd, 2014 at 12:49 pm	and tagged with cardmaking, crafter's workshop, distress techniques, my favorite things, Ranger, stamping, stencils and posted in Backgrounds, Challenges, Distress Techniques, General Cards, OWH. You can follow any responses to this entry through the RSS 2.0 feed. 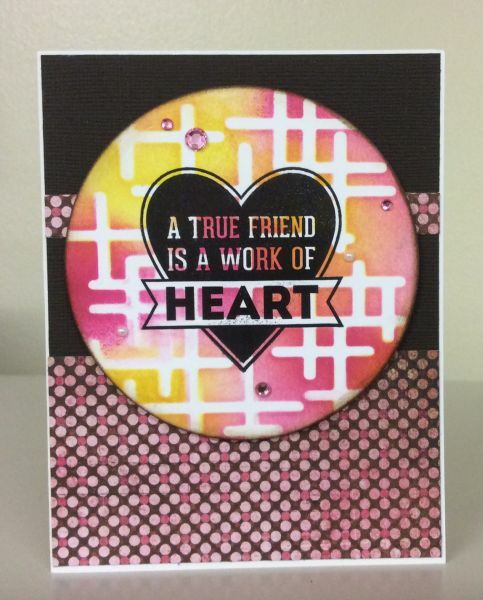 Really cute card, love your paper you made with the stencil and distress inks.